After spending a glorious year in Charleston, SC, I’m heading on the road! Visiting some of my favorite cities and favorite people (and favorite museums too). In the past year I was able to photograph an engagement session in London and a small wedding in Washington, DC. I love mixing some business in with my travel pleasure. So I’m offering 2 specials in addition to all of my normal packages. Headshots at any of my travel spots will run $125 (plus GA sales tax) for 30 minutes and 3 edited digital images with a print & use release. Great for beefing up your social media accounts (or your online dating profile). My elopement package is $750 (plus GA sales tax) and includes 2 hours of photography for 2-10 people. It also includes all the edited digital images with a print & use release. I average 50-75 images per hour at weddings. Have a larger party or need more hours? Take a look at my Wedding Guide here. Interested? 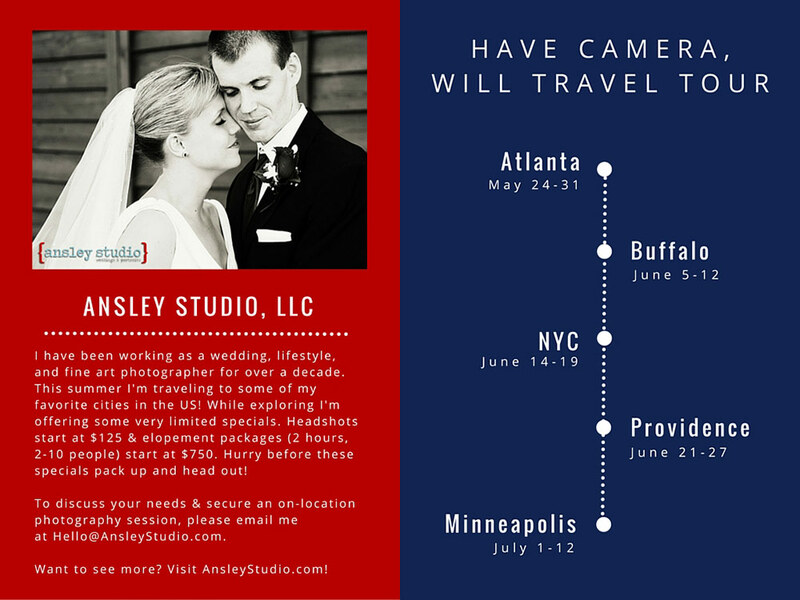 Send me an email at Hello@AnsleyStudio.com to discuss your needs and secure an on-location photography session. Hurry before these specials pack up and head out! PS – Ping me if you’re in Chicago, Indianapolis, Atlanta, or Orlando and looking for a July date. My return trip isn’t set in stone yet and I have a little wiggle room to play with the schedule.